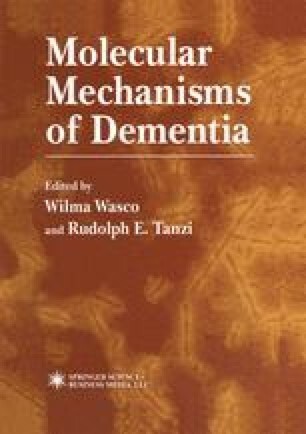 Alzheimer’s disease (AD) is a progressive neurodegenerative disorder of the central nervous system that is invariably associated with and defined by the presence of intracellular neurofibrillary tangles (NFT), and extracellular deposits of (3-amyloid in senile plaques and cerebral blood vessels in the brain. The etiologic events that lead to the generation of these pathological hallmarks and ultimately to synaptic loss, neurodegeneration, and cognitive decline are not well understood. However, it is clear that a significant portion of AD has a genetic basis (for review, see ref. 1). These familial forms ofAlzheimer’s disease (FAD) have been classified based on both the age of onset and the type of gene defect inherited. Within recent years, molecular genetic analyses have successfully led to the identification of three “causative” early onset (<60 yr) FAD genes located on chromosomes 1, 14, and 21, and, additionally, to the identification of an inherited “risk factor” for late-onset FAD (>60 yr old) on chromosome 19. In this chapter, we will concentrate on the causative defects in the three early onset FAD genes with an emphasis on the clues gained regarding the etiology and neuropathogenesis of the disease. The putative role of the fourth FAD gene, Apolipoprotein E (ApoE), and how it contributes to the disease process as a genetic risk factor will be covered in Chapter 2.